Hi friends! 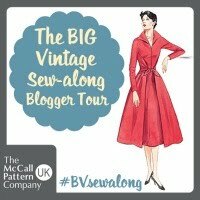 Today I'm delighted to share an interview with you, as part of April's schedule for the Vintage Sewing Pattern Pledge. 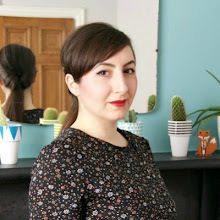 In showcasing her vintage pattern stash, Lauriana of Petit Main Sauvage, also takes us on a journey of the fascinating sewing landscape prominent in the Netherlands! Hi! I’m Lauriana from Petit Main Sauvage (and French speakers, I know the grammar is wrong). Before I get stuck into this interview, I think I should tell you a little about sewing and patterns here in the Netherlands. I don’t think the situation is unique, but it’s definitely different and it has contributed significantly to the character of my vintage pattern collection. When I was a child, my mother sewed for us and for herself. For children’s patterns, she subscribed to a magazine called Knippie (the children’s version of Knipmode, both of which still exist) and for herself, to Marion (which ceased in the 1990's). So, for as long as I can remember, sewing patterns came on pattern sheets and had to be traced. I don’t think I had ever seen a pattern envelope until I was about 23. As far as I know there have never been any Dutch producers of such patterns. In fabric stores, we can buy the usual ‘Big Four’ plus Burda, but only the latter comes in a translated version and we have to pay full price. Obviously, English is no problem for me and availability has improved dramatically over the years with the increase of online shopping, but that didn’t undo the early discouragement. 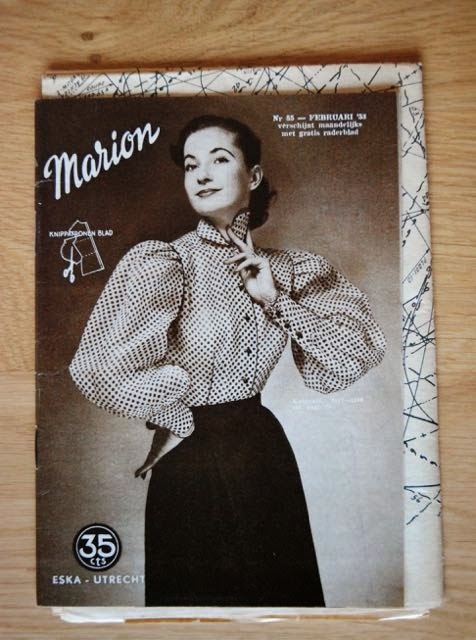 So, when I started looking at vintage patterns, I wasn’t very surprised that instead of the envelopes I saw on other people’s blogs, I mostly found magazines with pattern sheets. I don’t even really know…it just sort of happened. In March 2011 (thanks to the blog, I could find that out) my aunt, who sometimes volunteers at a charity shop, brought me a small stack of 1960’s and 1970’s Marion magazines. And not long after that, the market stall with second hand stuff where I buy things like gloves suddenly had two 1950’s magazines. After those coincidences, I started actively looking for vintage patterns, pattern making books and fashion magazines on our local Ebay-offshoot. 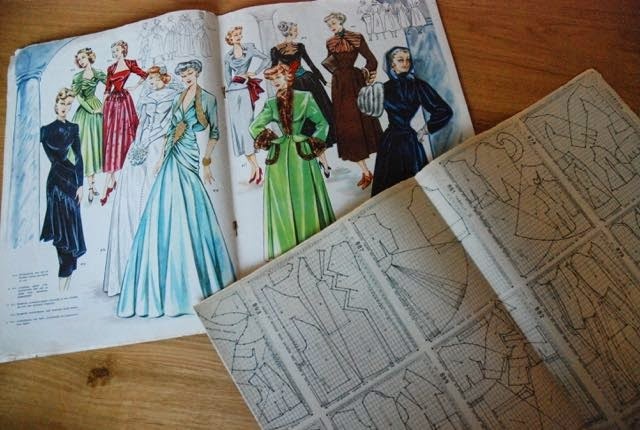 The vast majority of my vintage patterns are in magazines and I also have a lot of vintage fashion and ladies’ magazines without patterns (although there is the occasional ‘draft your own’ pattern in those) and some pattern-enlarging systems and vintage pattern making instruction books. That variety makes it impossible to count actual patterns. 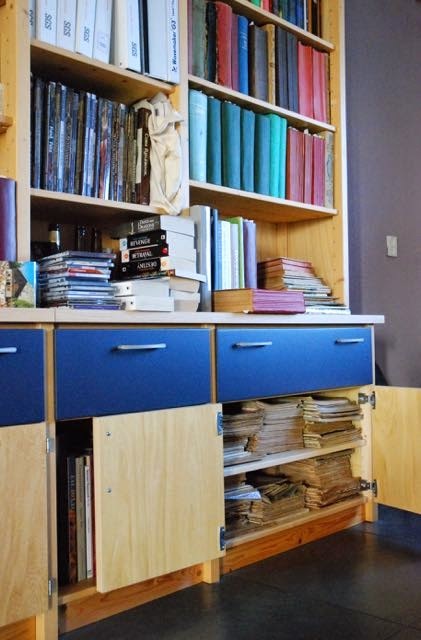 All those magazines and books came in all kinds of different sizes, so there is no simple solution to storing them. I mostly just keep them stacked like this in the bookcase in the living room. Those thick volumes on the shelves above are bound vintage ladies’ magazines. I learned pattern making before I started collecting vintage patterns so the main reasons have always been inspiration and education. I don’t find it particularly difficult to draft a pattern based on a dress in a picture, but I’m often curious about how exactly it would have been done at the time. How much ease did patterns include? Are those big collars separate pieces or were they cut on? And how did they make those fairly fitted kimono sleeves so they didn’t restrict a lady’s arms? 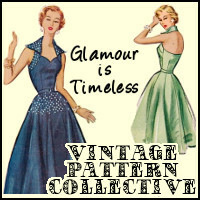 You can learn a lot of these things just by looking at vintage patterns and many more by making them. The answers aren’t always satisfying though. Freedom of movement, for example, was sometimes just sacrificed for style. Those fitted kimono sleeves without underarm gussets, for example, are restricting. I couldn’t come up with a clever solution for that because there isn’t one. I also use vintage patterns to try and explore new eras. I think I’ve figured out 1950’s is for me and I could do 1960’s mod or 1970’s if I wanted to, but I really need some help with the older stuff. For that reason, I actually love having piles of magazines rather than separate patterns. This way I get a clear look of the general fashion at that point in time instead of seeing just one great design. When starting out with a new-to-me era, that really helps me to ‘get my eye in’ before I choose what I’m going to make. And I also have three or maybe even four different ‘make these patterns in your size’ systems. To me, those are very interesting because finding patterns that fit us is the endless quest of any seamstress and finding great short-cuts for it is kind of a holy grail for sewing and pattern making teachers. I think it is very interesting just how many attempts to solve that issue were made pre computer-era. With such a system, any pattern in the book could be in my size. 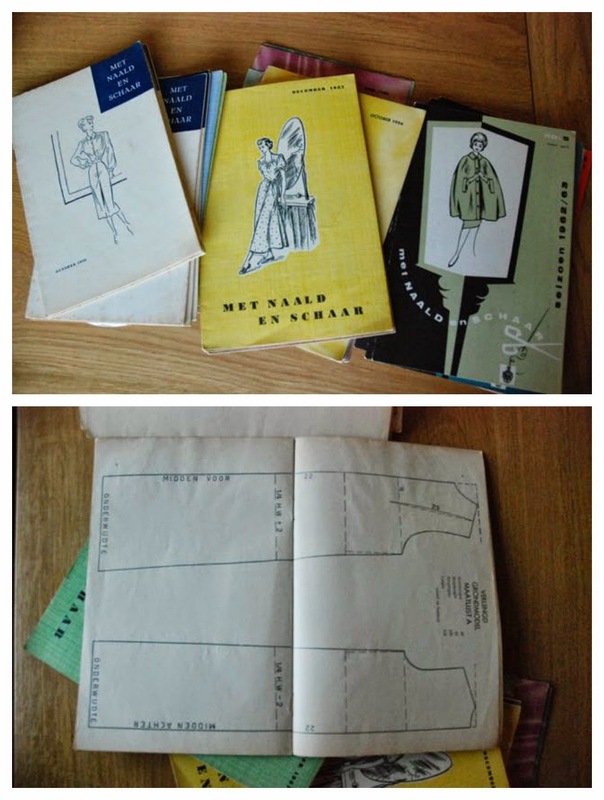 So far, I’ve sewn successfully using the Frohne system and I have made something using booklets from the Dutch radio course “met naald en schaar” (“with needle and scissors” mid-1950’s to early 1960’s). I was rather underwhelmed with the latter. Frohne uses miniature patterns which you enlarge using a special tool. It’s like the better known Lutterloh system (which I want to try out this year), the tool is just very different. 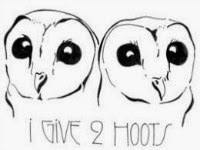 I’ve blogged about it here. 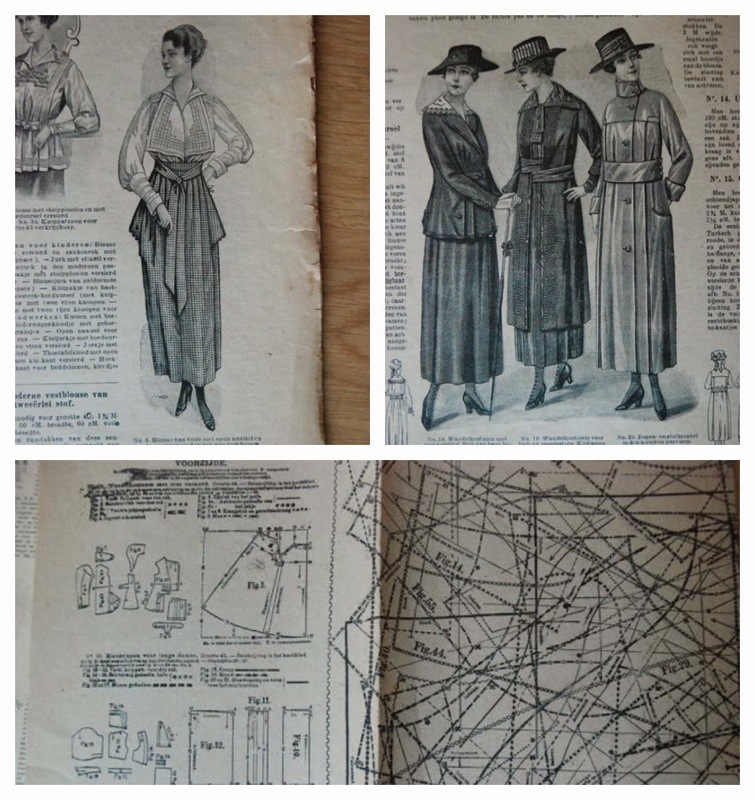 The Dutch booklets form a sort of ‘pattern making for dummies’ series. You are supposed to start with a very simple, straight, dartless sloper and then follow the instructions for different styles given in each booklet. From my pattern making experience (both drafting my own and trying to use this system), I think that’s a terrible idea which has you guessing at the exact position of bust and waist and hip every time. My favourite era to wear is still 1950’s or to be precise, from 1948 when the ‘New Look’ was accepted by the general public to somewhere in the mid-to-late 1950’s (no exact year there) when the increased availability of nice fabrics made designers lazier when it came to normal clothes. I especially adore the dressy afternoon looks from those years. However, I’ve been using both my collection and the Vintage Sewing Pattern Pledge to get out of my comfort zone. I love last year’s 1920’s dress and I really have to sew more from that era. I also adore pictures of 1930’s dresses, but I’m still very unsure whether I can make that look work for me. What’s the oldest pattern in your collection and have you made it? My oldest pattern, like most of my collection, is not a single pattern but a magazine with a pattern sheet. 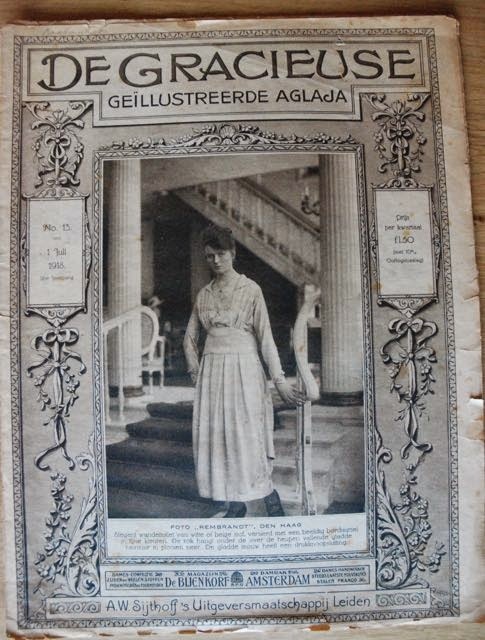 It’s Gracieuse magazine from 1 July 1918 (which is actually the second-oldest of my Gracieuses but the oldest doesn’t have its pattern sheet). And the patterns included (each in one size only), are for things like these. I haven’t made any of these. I think this is an interesting transitional era in fashion, but not something you can easily merge into an everyday wardrobe. Can you pick three favourites and have you made them? That’s such a difficult question! I’m just going to pick three patterns I really like and feel I should try and make (and ones I could make because I have the pattern and it should be near my size). I like both these dresses from the autumn of 1929, from Gracieuse but it’s the one on the right I really love. These are almost perfectly between 1920’s and 1930’s in silhouette and full of interesting details. And I always love unusual skirt shapes. 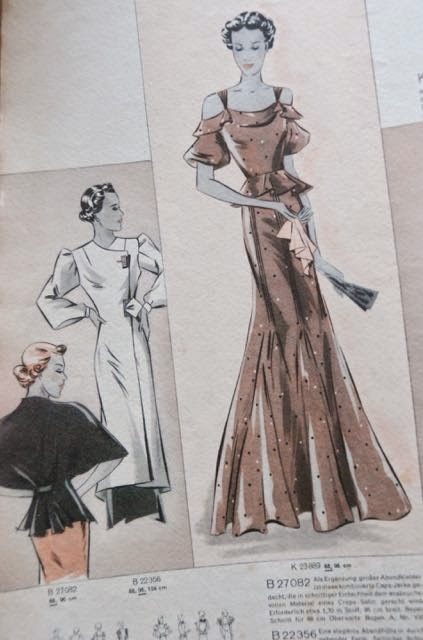 Then, there’s this amazing evening gown from Beyer’s magazine from January 1937. Or, lacking occasions to wear such things, at least that cute capelet/jacket. From around 1950 but undated is this pattern. One of the very few single patterns in envelope in my collection. It’s an unprinted pattern and there are no instructions, which is common in my collection. In the magazines, all they tell you is how much fabric you need and a rough order of construction. I love the collar, the pleats, the pockets and just the whimsically suit-like design. To be honest, I’m no good at getting rid of patterns. Because I use them mostly for inspiration I just like having a lot of magazines to look through. 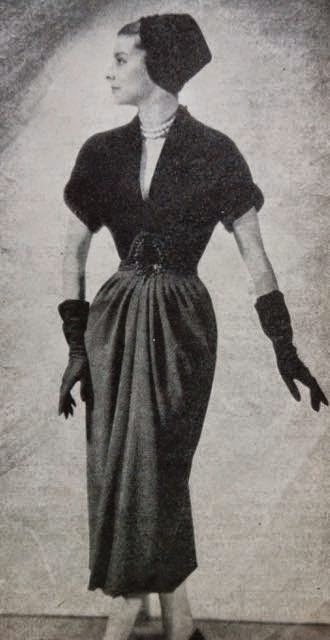 This question brings one particular magazine to mind though: La Femme Elegante for winter 1949. 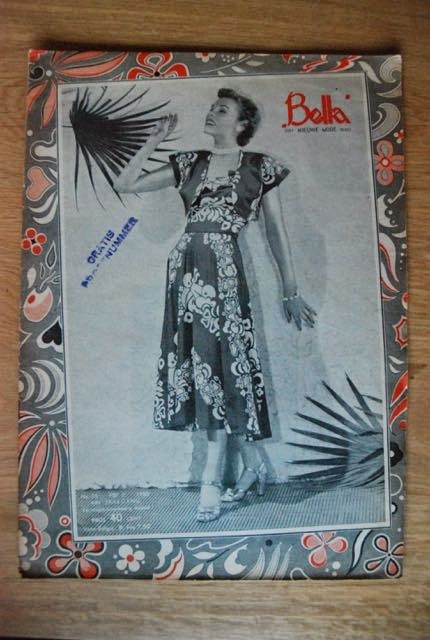 I have a few more issues of this magazine but those are from the late 1930’s and come with normal pattern sheets. This one is quite enthusiastically illustrated and includes some pretty over-the-top designs. Great designs and there’s an unusually high number of them on the pattern sheet. But that’s the problem. La Femme Elegante has come up with the most unlikely draft-to-size system. You are supposed to take a giant piece of paper and fold and fold it creating little rectangles (32 high and 32 wide) sized according to your bust circumference and height. You should then use those to copy the miniature patterns. They claim this will give you a perfectly to size pattern. I don’t even think you could manage to fold a piece of paper that many times and even if you worked around that (using math rather than folding to get the rectangles) it’s still a pretty sketchy method. 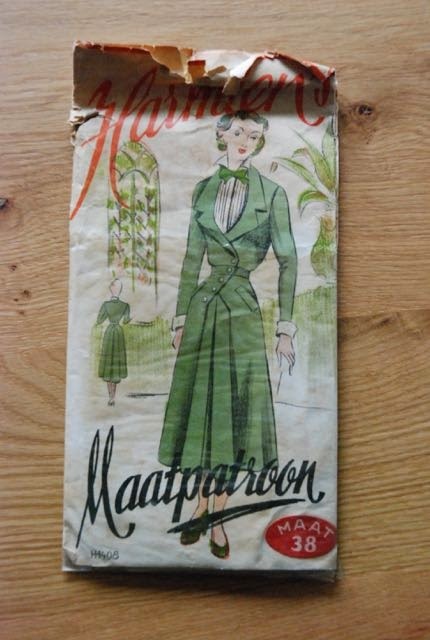 I find the vast majority of my patterns on Marktplaats, an Ebay-owned auction site here in the Netherlands. Vintage patterns are not hugely popular here so prices don’t get crazy and, of course, I don’t have to deal with international shipping. On the other hand, it’s very hit-and-miss and it would be nearly impossible to look for a specific pattern here. Most of my collection came from people who were selling the stuff they found when clearing out grandmother’s attic. Those people are usually happy to sell to an enthusiast, seamstress and collector rather than to a trader. I’d like to thank Marie and Kerry for all their efforts for the Vintage Sewing Pattern Pledge. I really enjoy it. Thank you so much Lauriana! This was such an interesting read and you have a very enviable selection of patterns. 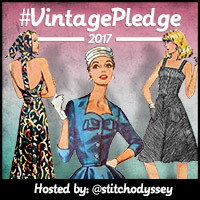 If you're reading along and want to join the #vintagepledge, you can sign up here. For inspiration check out our dedicated Pinterest Board and find out more about April's generous offers from Adele Bee Patterns and Simplicity here. Thanks Lauriana and Marie, it was fascinating to learn about a different kind of vintage pattern sector where magazines are much more prevalent. 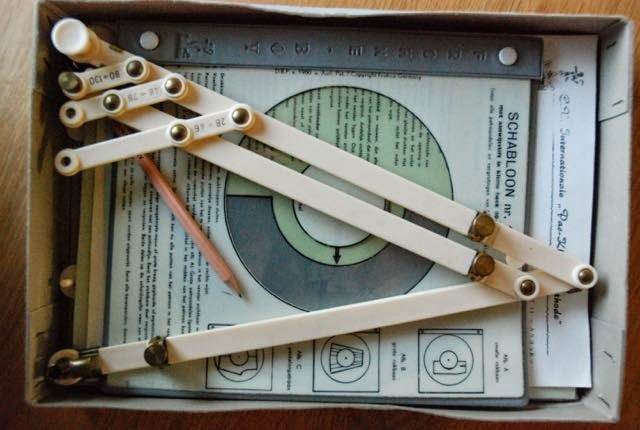 The pattern enlargement systems are so interesting to hear about, though they do sound tricky! Love the post, just getting started with the lutterloh system and I'm hooked! Wow! This is incredibly fascinating! I very much took for granted that printed patterns were the standard for sewing. I have never worked with a magazine like the ones in Lauriana's collection. Hi Anja, as I said in reply to the last question, I find most of my collection on Marktplaats. If you look in the 'hobby' category, you can search under 'kledingpatronen' and if you look using the search term 'vintage' or 'retro' you will usually find at least some Marion magazines. Looking in other categories, like 'magazines', using appropriate search words can also help but you have to be careful. A lot of sellers don't really know what they are selling and it often isn't clear whether or not the pattern sheets are still with the magazine (I usually email to ask). Those Gracieuses were really a one-of-a-kind find. What an interesting perspective! Thanks for taking the time to teach us about a different culture's pattern history. That folded paper to grid idea sounds crazy.